We live in a globalised world, where the internet has allowed people from all over the planet to communicate with each other and, more importantly, for us gamers, it means that we meet and make friends all over the world with whom we can play our games. In addition to this, people travel around the world far more than ever before in the history of mankind! As such, people from one region might move to another region but still will want to be able to play with their friends in their original region. This also means that cross-region support is becoming an increasingly more important issue. This article will thus take a look at how different games handle, or in worst case, fail to handle the issue of cross-region support. Which games have gotten it right? Which games have done it completely wrong? Is there a perfect way to handle cross-region support? Cross-region support affects both paid and free-to-play games and different developers have gone about the issue in completely different ways. So where did the issue first arise? Well in classical game multiplayer design, developers would simply implement a server browser in which everyone from all over the world could create, rent or purchase servers. Players could then pick the server they wanted to play on, with the connectivity they want and in the region they want. However, with the implementation of matchmaking and the creation of MMO (Massive Multiplayer Online) games, cross-region play is now in the hands of the developers and no longer the players. This does not mean that matchmaking systems and MMO games are a bad thing; it simply means that developers now need to put more time and especially thought into this issue, which all too often is overlooked. The first title that made me personally aware of the issue was World of Warcraft. When it came out; I was the owner of my own retail video game store. As such, I had a lot of contact with my customers who purchased the game and many of them played on the American region, as they were Americans living in Belgium. The issue then arose that they had to purchase two copies of World of Warcraft, one from my shop to play on the European servers and one from an American shop to play on the American servers. Obviously this is not an ideal system and has no logical reason for it. As Blizzard could have easily had one master account system for all regions and simply allowed players to pick the region in the server browser after logging in. While Blizzard does not seem inclined to listen to player feedback (as they kept the same system when Starcraft 2 first launched, thus proving they did not care at all about the player feedback provided on World of Warcraft), other developers were listening, namely BioWare. When BioWare created Star Wars: The Old Republic (SWTOR), its failings aside, one thing that BioWare definitely did completely right is that your SWTOR account works in all regions. Thus all players have to do is login and then on the server browser pick the region and server they want to play on, no requirement of purchasing a key for each and every region, which honestly is ridiculous and shame on any MMO developer who does it this way! BioWare is not the only MMO developer who saw things differently than Blizzard (now Activision-Blizzard, a surprisingly perfect fit, no?). ArenaNet (published by NCsoft) created Guild Wars. Guild Wars 1 and 2 handle the region issue very differently from both World of Warcraft and SWTOR. For Guild Wars, players can purchase the game in any region and then create a maximum number of total characters (e.g. 8 on Guild Wars with all expansions purchased). However, these characters are usable on all regions, thus you can play on your local region if you want good connectivity, but if you want to play with friends in America or even Asia, you simply switch to their region or to the specially designated International server. Ignoring the issue of not being able to create over 9000 different characters, a more ideal approach to cross-region support in MMO games there is not. Guild Wars 2 keeps a similar system but instead introduces a new Home World server, but this does not stop players from joining others anywhere in the world with the same character, simply by partying up and going as a guest to your friend’s server. Of course, the character limits is one of the biggest issues with their system, but bear in mind, Guild Wars 1 and 2 have no monthly payments and as such the character limit is actually due to that and not due to the server system. Another advantage of the Guild Wars 2 system is that MMOs then do not end up with the empty server issues that SWTOR experienced quite heavily post-launch. Guild Wars is not the only MMO to implement such a master server system, Star Trek Online also used a similar system. Where once players are logged in they can simply pick the server region they want to go. So far I have only discussed the issue of cross-region play in MMOs, but with the increasing number of free-to-play (F2P) games, the issue is becoming ever more noticeable amongst these titles. The most popular F2P game in existence today, and one of the world’s most played games, League of Legends, does not support cross-region matchmaking. In fact, each region is completely separate and within what are normally whole regions there is now even more separation. As such, League of Legends has six regions currently, all of which have a separate account system and of course, only perform matchmaking within the region. The regions are North America, EU West, EU Nordic & East, Brazil, and Turkey. 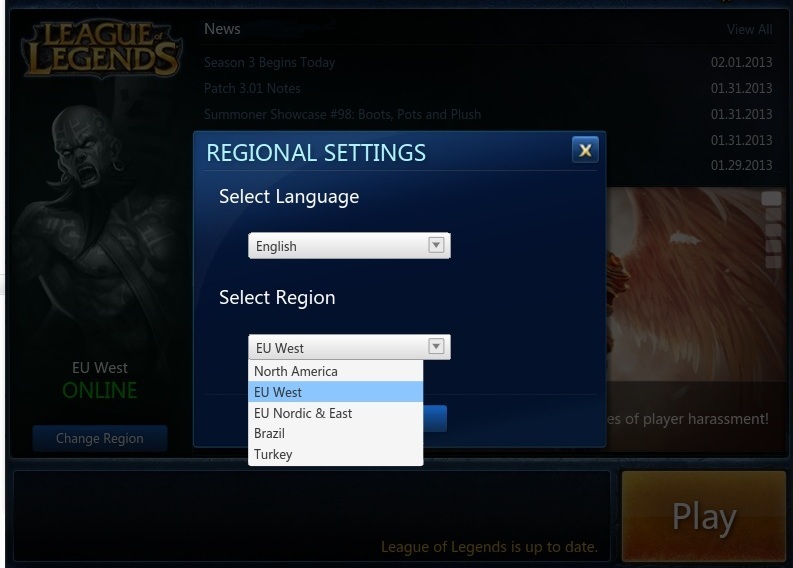 In addition to those five regions, League of Legends also has a sixth region, Asia. The Asian game however, is a completely separate client and is not an F2P game, but has all content included with a one-time purchase price. This means that players who want to play together between America and EU must create a separate account, which is not ideal as it is an F2P and thus all your skins, champions, runes and masteries will not be on the separate accounts. Fortunately, there is a region transfer functionality between the EU regions, but these are only free to use once, after which players must pay real money each time they want to perform a region transfer. Other F2P titles do not do it so differently. Looking at ones such as World of Tanks, World of Warplanes and soon even World of Warships; all of these are region split and thus if you have American friends and live in Europe, you are forced to make a separate account or simply forgo playing with each other completely. There is hope though within the F2P titles, looking at inspirational titles such as DOTA 2 and Smite shows that not all developers are blind to the issue of cross-region play. Valve in particular has gone out of their way to make DOTA 2 as international friendly as possible, players can join up with friends all over the world and then pick the region they want to be matchmade in. This will then determine the location of the server that they will play on and of course, the language the allies and enemies speak. The matchmaking will always go for the closest region first, unless that region is disabled by the player in the matchmaking menu. 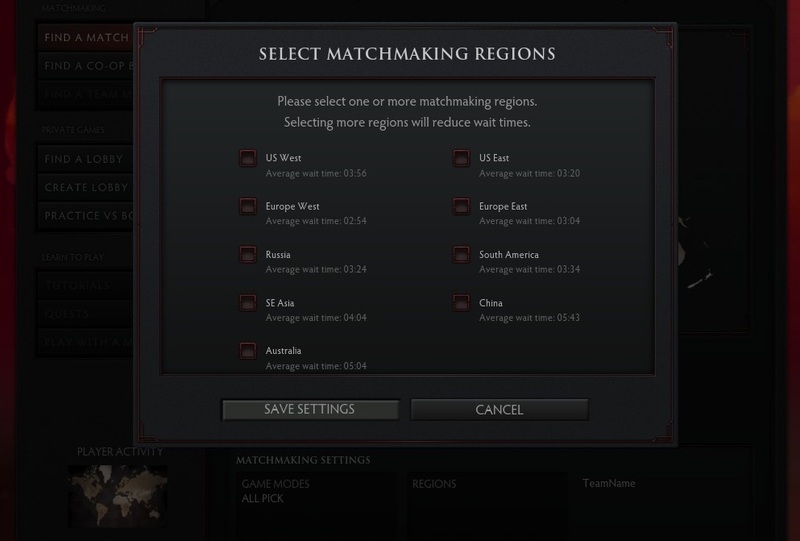 The regions players can enable and disable in DOTA 2 are US West, US East, Europe West, Europe East, South America, Russia, SE Asia, China, and Australia. Each of these have their own waiting times and players can enable multiple to be matchmade in whichever will find them the best match the fastest. 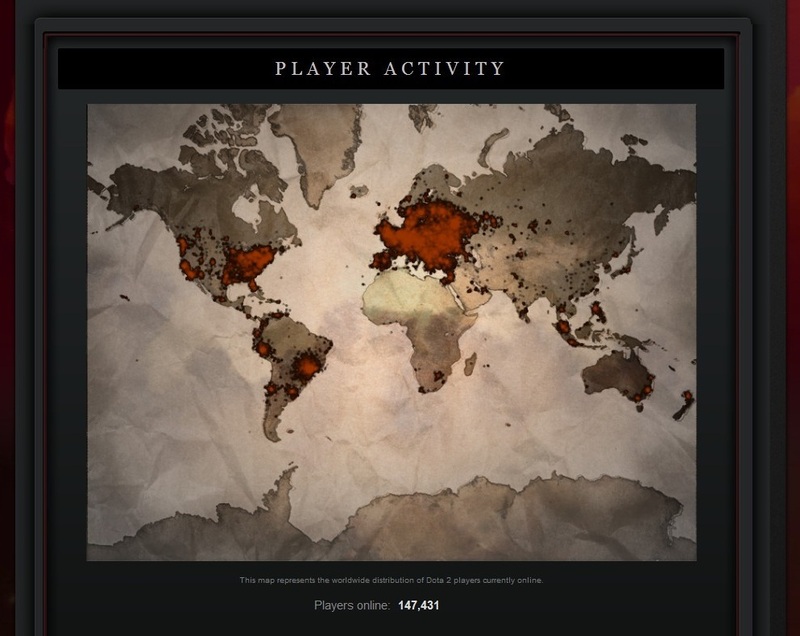 Valve even took this a step further and has a map showing the rough distribution of where all currently online players are located. While Valve’s highly experienced and highly skilled development staff allowed them to implement such state-of-the-art matchmaking technology, other developers such as those of Smite went a simpler, but no less functional route. On Smite, players can login with their Hi-Rez Master Account and then once in the main menu of the game, they can set the region they want to play on in the mode selection menu by choosing from a drop-down list (currently only Europe and America). Smite and DOTA 2 are of course not the only two titles that do this, but the list of F2P games that have such well implemented cross-region support is sadly very limited. Attention to detail! Really neat feature, despite not being necessary at all. This brings us to the end of this article and topic and leaves all our eyes set on the future. The main point is for gamers to really make it clear to developers that this is an important issue, once enough gamers make an issue out of it and really speak with their wallet then perhaps more developers will put more attention in this often forgotten element. With such great examples of MMOs that have designed great cross-region support and great examples of F2P titles such as DOTA 2, it will hopefully only be a matter of time before more developers create an open region game that brings gamers together across the world, rather than split them up into micro-communities that all miss each other, miss friends and miss family. Well, when it comes to Russians in online games, I have an idea. While in the Western Europe and USA consoles are often the platform of choice for kids, in the Russia PC dominates for all age groups. Minors are known for immature behaviour in many countries and a lot of Russian players are minors. I've actually had many of my Steam friends complain to me about Russians on DOTA 2. While I'm not one to judge racially, I must admit that I've had many personal experiences with Portuguese, French and Russians on League of Legends and now even on Smite; where they just non-stop flame, feed and generally troll. While one would say - oh but surely other racial groups do that? Well in the start of each game I tend to ask where everyone is from and so far I've not personally encountered close to as many people from other countries that have flamed and trolled so hard as those from France, Portugal and Russia. The Russians in MOBAs tend to troll the hardest and flame the hardest. I don't know why it is this way, but its sad really and I honestly wonder what it is about these cultural backgrounds that make the MOBA gamers from these areas so obnoxious and stand out among the rest of the bad part of the MOBA community. Perhaps one day someone will perform a study in it? That would definitely be a study I would love to read. .... As long as the Russians are segregated into their own groups. Can't stand those guys, they're so obnoxious.